The Inner Alchemy series of CD's are exceptional. The music is really good, and complements the text really well. I found the Cds' are full of surprises. Just when you feel that the main thrust has been followed, you come up with unexpected twists that make the process special. The surprises for me were, Power animal, Yin and Yang, Inner Healer and Inner child, I loved them. M.B.Ch.B. F.R.A.C.G.P. General Practice and Integrative Medicine. These meditations are a marvelous technique for achieving deep relaxation and building positive self esteem. Mary's voice is particularly suited to guiding the listener on their inner journey, creating a calm and soothing atmosphere. I wholeheartedly recommend these journeys to anyone wishing to embark on the path of self-discovery and spirituality. I have listened to the C.D.s. They excellent on all levels. Your tone of voice ( most important) and volume is exactly correct for the listening ear. The words are simple in an everyday language. You do not talk down to the listener. ( most important) You give calm guidance as well options to the listening ear. Allowing them their own journey into their own world. They can not get" lost" or feel threaten, but feel secure with the sound of your voice. I also adore the music. Your friend David is certainly gifted and exactly correct for your voice. What a team. I am so excited about all these CDsThey are going to bring some amazing results everywhere.They emanate something even just looking at them. I love the whole packaged presentation. The colors, the design, the style of the printing. Everything is perfect. Sorry to be telling you everything you already know. I am just so enthused for some reason. I just can't wait to give these to those in need who will benefit greatly. I am sure they will want to obtain more. Connecting to the Wise You. What a journey. The musical score is divine – a mixture of entrancing melodies that truly do take you on a journey so pure and captivating. Personally, I was taken to place of total unconditional love and given a life changing gift. I know my aura (which I happily keep well tuned) is, as I write – so expanded and pulsating, vibrant and electrified with beautiful energy. A stunning meditation. I can easily recommend this CD to any and all of you, who want to find that inner wisdom to guide you and present you with your own special gift. I know I did! in meditation cd's. Our clients keep coming back to purchase more of the series after experiencing success with their meditations. There is a great variety of themes and the music is tranquil. The presentation and packaging for merchandising is striking." I will be in touch in the early spring to place another order. Records, total running time for each CD approximately 1 hour. performed by David Sandercock, B.Mus. (Hons.). L Mus. experience is enhanced by using headphones or earphones. or healing path and what visualizations you produce will be your own. on a regular basis. I will certainly be using them. just to let you know it wont be long before i need more stock!! They are flying out and the feedback is brilliant- am even getting text messages to my phone from customers-one comment was that it was the best 56 minutes he had spent in ages-from a psychology graduate. Another came in with his girlfriend who has been carrying a notebook to write down all the things he is coming out with as he has just opened up so much. These guided meditation CDs work with the deepest levels of your brain and soul, using a process that involves binaural beats, guided voice, beautiful music, subliminal messages, trance-inducing frequencies and creative visualization. Mary Rodwell, a West Australian counselor, nurse and guide, uses various hypnotic and trance techniques to allow you to access your inner alchemical processors. The Inner Alchemy series of meditation Cd's are based on the metaphysical understanding of alchemy, which is the transmutation of base metals into gold, but in its highest form means the alchemy of inner transformation. 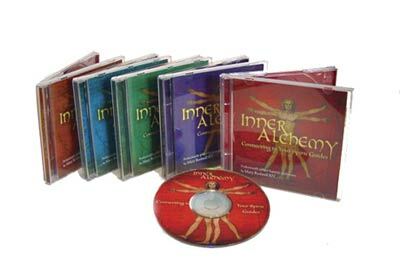 Inner Alchemy Cds provide a unique 'tool ' which can facilitate this inner process, and assist you to create a doorway to your 'intuitive ' super nature and higher wisdom. The Cds are a combination of 'intuitively guided" creative visualizations, trance inducing frequencies, evocative music and subliminal positive affirmations, which will help you to remove old limiting patterns of thought. Each individual Cd has a particular 'intent' or focus which will help you to connect with your higher awareness and the understanding you desire. These Cds are created as 'tools ' of potential for this inner growth, and transformation. Inner Alchemy awakens our super conscious nature. I have recently purchased several of your Inner Alchemy Cds and I am very impressed with both the quality and content. Your voice is very soothing. I just finished experiencing Nurture Your Spirit. BRILLIANT BRILLIANT BRILLIANT!!!!! I must admit that I loved Inner Alchemy so much that I wondered if Take Ten could match it. Well Take Ten has certainly matched it. I couldn't make it thru the Mother Earth section as I was so excited by what I had heard in the previous selections. I had to jump up and write this to you. I will look forward to experiencing Mother Earth this evening in bed. I can't wait to experience Optimum Health - I just know it is going to not just start the new year off with a healthy goal but maintain my desire to have a healthier life style. Soul Flight is almost exactly what I experienced in my out of body experience in the hospital - my God how wonderful! I found these Cds amazing. They have definitely made me more aware of my psychic abilities and expanded my mind. I have used other cds before, but nothing compares to these. Thank you Inner Alchemy. I really enjoyed exploring my past life. I had a profound experience whilst listening to that Cd. A doorway opened up for me, and everything now in my life makes sense. Cant wait to try them all. I love listening to the inner peace CD. My life had been quite stressful and I am so glad I have found your product. I now feel more calm and at peace, and ready to tackle things effortlessly. I found the chakra activator very powerful. I could actually feel my chakras open up and start to activate. I feel now more energized and in control of my health. Thank you for such a great product. Thank you for such a wonderful gift. I have suffered from very poor health, with a number of major medical illness. I started listening to you Inner Healer cd last week, and I am feeling better now every day. It really works. Thank you for helping me to cleanse my mind and body. Wow, I actually met my spirit guides with your cds. What an amazing and loving experience. You have opened up a whole new world for me. Thank you for helping me to connect with my angles. The CD that we LOVE is Take 10. Absolutely fantastic, I really WAS at the beach, and in the forest, and under the stars...... :-) Maybe you can make one for being IN A CROP CIRCLE ??? ?